Gear Kitty is brave enough for this kind of adventure, but without your guidance it won't lead anywhere. Help the kitten in gathering red hearts and avoid water pools. Activate gears and proceed further. 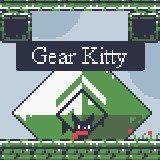 What you will never take away from Gear Kitty is its courage. It's brave enough to deal with all obstacles ahead, but you should better guide it. Take control of the kitten and collect all hearts, that unlock the next piece of the riddle. Avoid traps and water pools and see where it all leads!